Uncharted 2: Among Thieves Will Hopefully Be The Blockbuster Game Sony Crave. What released in 2007, eventually felt like a game from 2008 when Naughty Dog patched in trophies, drawing everyone into their Playstation 3 blockbuster. 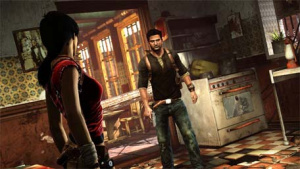 Worldwide, Naughty Dog have confirmed the game eventually went on to sell 2.5Million copies, and multiplayer designer Justin Richmond suggests that with Uncharted 2: Among Thieves they want to be "higher". We think Uncharted 2 will certainly blast out of the gates. The Playstation 3 is in a stronger position now than in 2007, and the Uncharted franchise also seriously carries some weight these days. Make sure you've got your preorders ready.